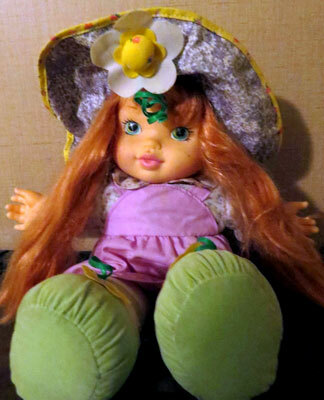 Images on this page thanks to Etsy seller OnceAgainTreasure, and eBay sellers pugsandkitties*lynne , hotrodrev , vintagedollsandmore , karebearthree , katrinastoys , momsxtracash , americantreasureco , davdiesel , c-s-goodies , redcarousel5 , finderskeepers816 , paynebecky , ginnette2005 , den268 , myidq and spedtchr_4life ! 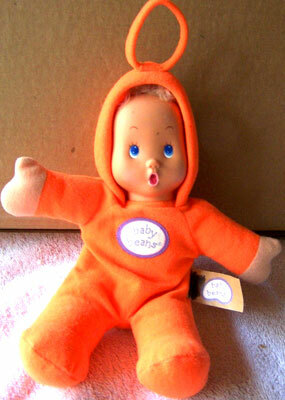 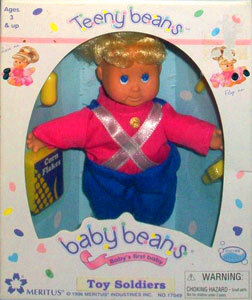 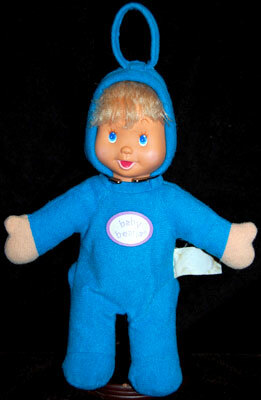 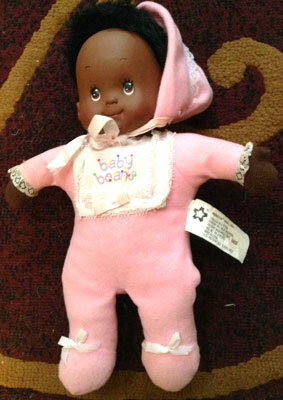 Meritus took over production of Baby Beans from Mattel in 1991, redesigning the dolls and logo. 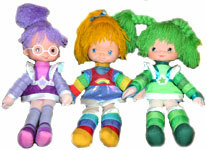 These look to be the first dolls produced by Meritus, which measured about 10 inches high. 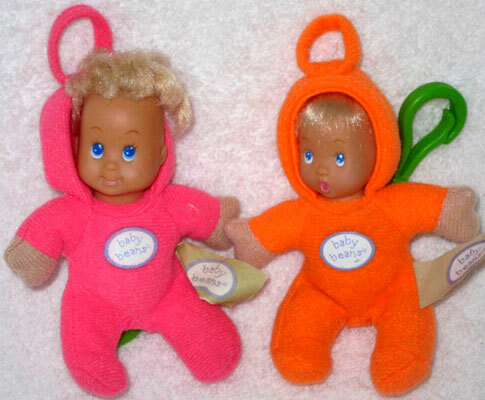 These two dolls must be pre-1997 as they have white labels with no logo. 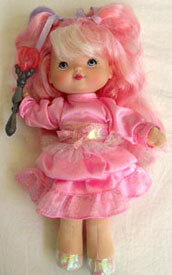 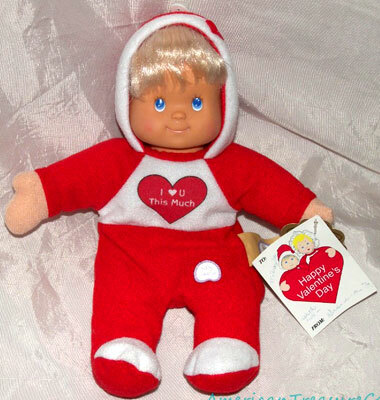 The Valentine's doll was produced in 1998. 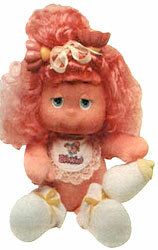 The floral doll is most likely from around 1997 as it has the logo on its label. 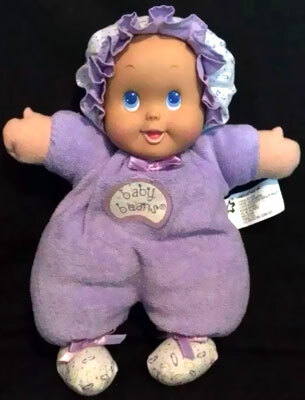 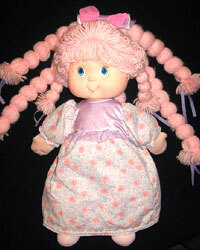 I found a trademark registered by Meritus in 1992 for Big Kids Beans, which this doll may be one of. 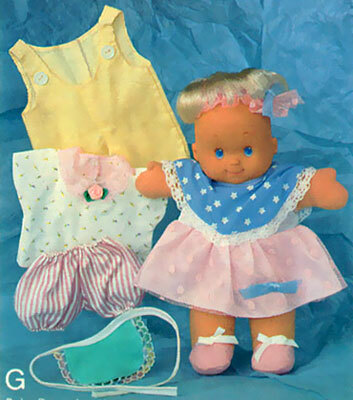 There were at least two layette sets produced in 1991/92, which included a dressed doll with extra clothing. 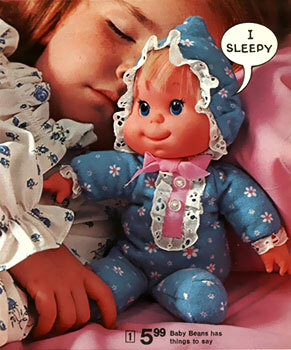 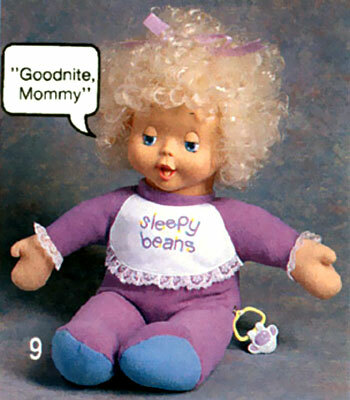 Sleepy Beans doll was produced in 1991. 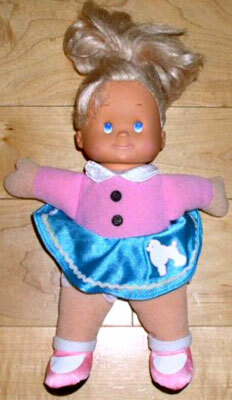 She spoke six random sentences when her pet lamb was pulled (by record I presume). 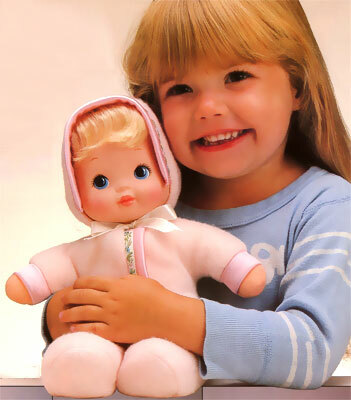 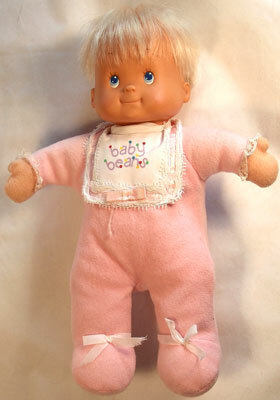 In 1997, Meritus produced a 30th anniversary special Baby Beans doll called "Violet". 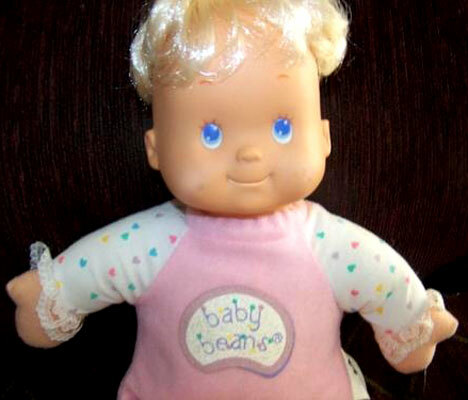 I don't know if others were produced or what the 30th anniversary (1967) was for as Baby Beans originated in 1970, making them 27 years old in 1997. 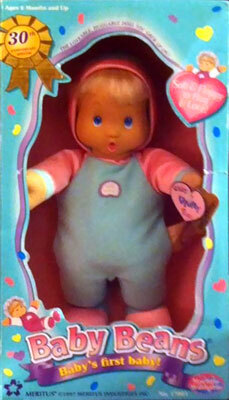 I'm not sure of this lines official name or release date. 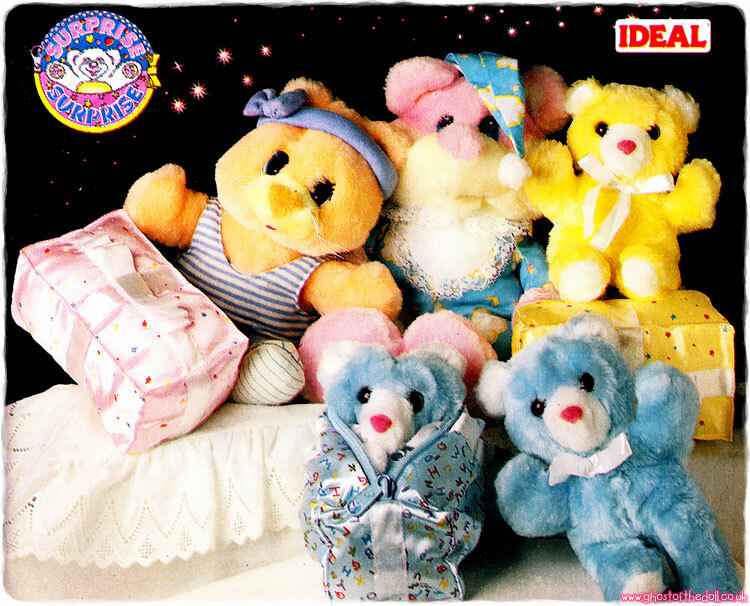 They were about 10 inches high and squeaked when squeezed. 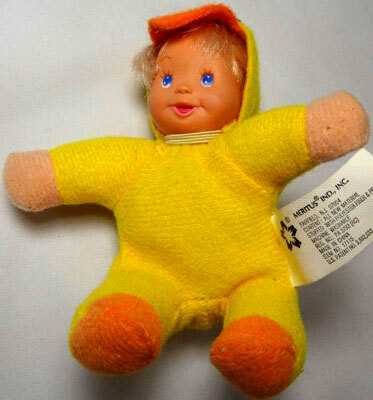 I don't know how many were produced. 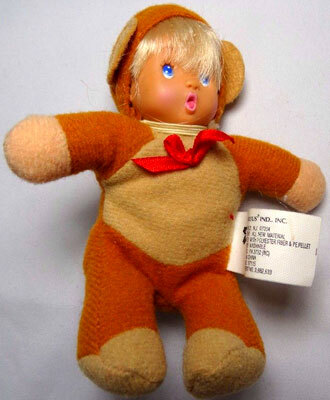 I'm not sure of this lines official name or release date. 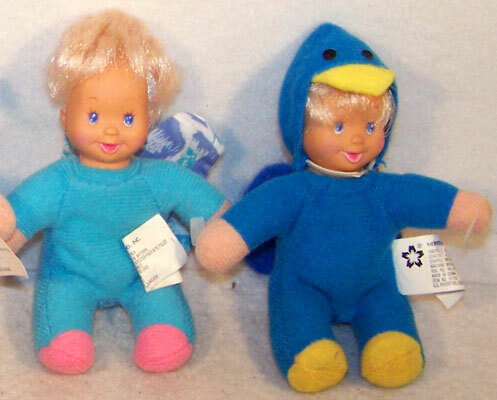 They were about 5 inches high with a clip sewn onto their backs. 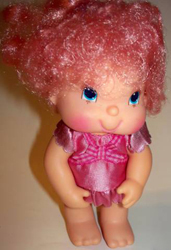 The same head moulds were used for the all other dolls at this size, so there was probably a third clip-on as there were three different head mould. 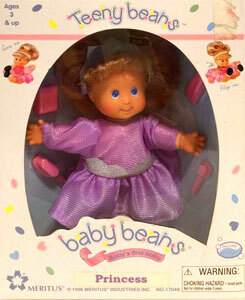 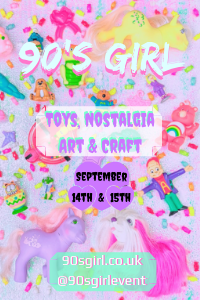 Teeny Beans were produced in 1996-97 and there were at least seventeen different dolls. 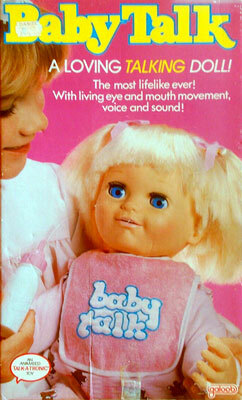 Unfortunately the packaging doesn't list them all. 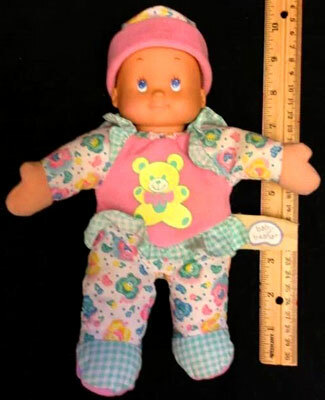 Each doll measured about 5 inches high. 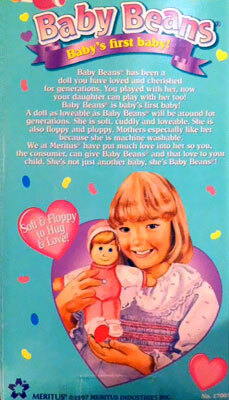 They had brushable hair, plastic heads (all the same mould), plastic hands and fixed plastic shoes. 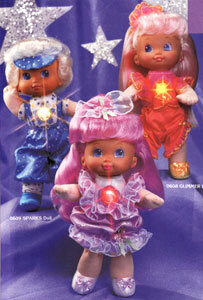 Each doll came with four little accessories. 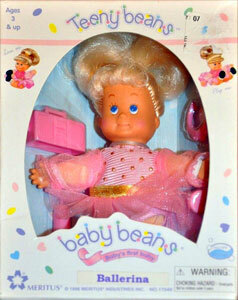 There were at least five Teeny Beans produced in 1996. 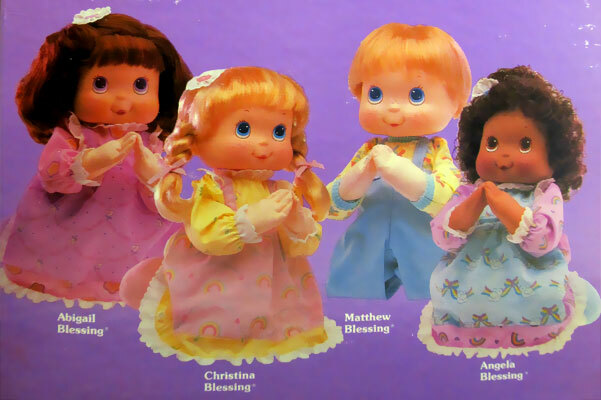 They all had rounded window packaging. 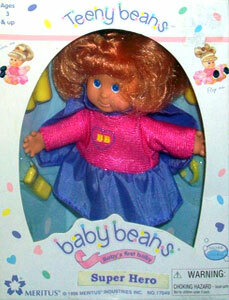 At least twelve more Teeny Beans were added in 1997. 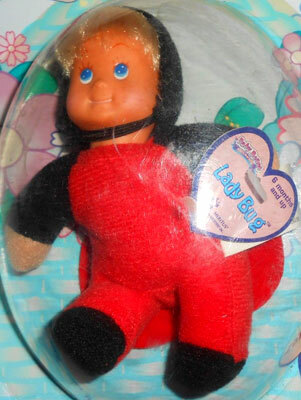 The packaging now had a squarer window. 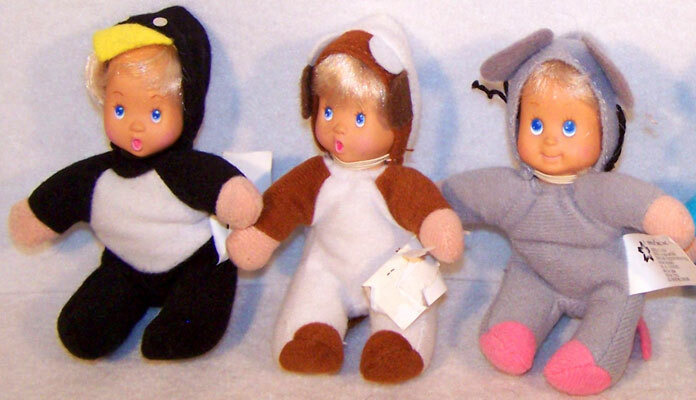 There were twelve Teeny Beans produced in 1997 which were dressed as animals, insects or a flower. 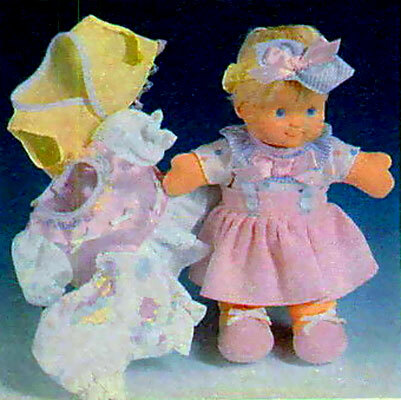 The measured about 5 inches high with fabric bodies and a choice of three plastic head moulds. 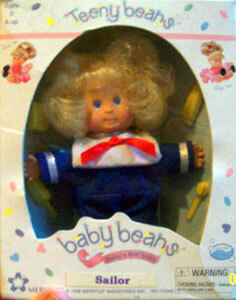 I found two as yet unknown bean related trademarks registered by Meritus, but were probably unproduced.